Not to be confused with Emmet Dalton. Emmett Dalton (May 3, 1871 – July 13, 1937) was an American outlaw, train robber and member of the Dalton Gang in the American Old West. 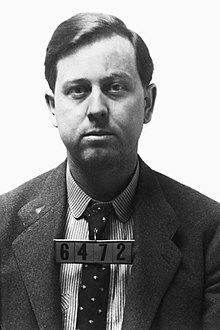 Part of the ill-fated Dalton raid on two banks in Coffeyville, Kansas, he survived despite receiving 23 gunshot wounds. After serving 14 years in prison for the crime, Dalton capitalized on his notoriety to author books and become an actor in Hollywood. The Dalton Gang's criminal enterprise was ended on October 5, 1892 when they attempted to rob two banks at once in Coffeyville, Kansas. Four of the gang were killed in the ensuing gun fight. Emmett Dalton survived the raid but received 23 gunshot wounds. He was given a life sentence in the penitentiary in Lansing, Kansas and pardoned after fourteen years. He moved to California, where he dabbled in acting before getting involved in real estate, dying at the age of sixty-six. He was married to Julia Johnson Dalton, who survived him. In 1918, he portrayed himself in the movie version of his book Beyond the Law. In 1931, he published When the Daltons Rode, which was later made into a 1940 movie starring Randolph Scott. Emmett Dalton was portrayed by Frank Albertson. Dalton, Emmett and Jungmeyer, Jack. When the Daltons Rode, Garden City, New York: Doubleday, Doran & Company, Inc. 1931. Latta, Frank F. Dalton Gang Days. Santa Cruz, California: Bear State Books, 1976. In 1954, the actor Robert Bray played Emmett Dalton in the episode "The Dalton Gang" of the syndicated western television series, Stories of the Century, starring Jim Davis as fictitious Southwestern Railroad detective Matt Clark. In the 1954 film Jesse James v. the Daltons, the part of Emmett Dalton is played by William Tannen, who was later cast as Deputy Hal Norton in fifty-six episodes of the ABC/Desilu western series, The Life and Legend of Wyatt Earp. Tyler MacDuff portrayed Emmett Dalton in the 1957 episode of the CBS documentary drama series You Are There entitled "The End of the Dalton Gang (October 5, 1892)." A caricature of Dalton appeared in the 1954 Lucky Luke album Hors-la-loi where he's depicted as the tallest of the Dalton brothers. In the album the disastrous double bank robbery of Coffeyville, Kansas is depicted but, differently from what actually happened, Emmett Dalton is seen killed along with his brothers, including Bill Dalton who actually never took part in the raid. Emmet's grave is pictured in the final panel of the story alongside his brothers and a sign that says "The Daltons died with their boots on". Each grave has the hat of the respective owner placed on the crucifix with Bill Dalton being shredded with bullet holes. Emmett reappears on a wanted poster in Les Cousins Dalton, his character of tallest of the Dalton Brothers being taken over by Averell Dalton. In 1959, Harry Harvey, Jr portrayed him in an episode of "Tales of Wells Fargo" entitled "The Daltons." The actor Tom Skerritt played a youthful Emmett Dalton in the 1963 episode "Three Minutes to Eternity" of the syndicated western series, Death Valley Days, a dramatization of the simultaneous bank robberies in Coffeyville. Forrest Tucker portrayed Bob Dalton; Jim Davis, Grat Dalton. The episode was narrated by Stanley Andrews, known as "The Old Ranger". In 1975 Emmett Dalton was played by the actor Tim Matheson in the TV movie western The Last Day. In a mid-1980s interview with Spirou Magazine, author Maurice De Bevere, also known as Morris, admitted that reading Emmett's book When the Daltons Rode was his inspiration to create the comic version of the Dalton Brothers. ^ "The Dalton Gang". Retrieved 3 April 2017. ^ "DALTON Family History: Old West Kansas - Dalton Gang - KS Heritage Group - www.kansasheritage.org". Retrieved 3 April 2017. ^ a b "IMDB - Emmett Dalton". Internet Movie Database. Retrieved 2007-07-11. ^ "Three Minutes to Etermity on Death Valley Days". Internet Movie Data Base. Retrieved August 5, 2015. Wikimedia Commons has media related to Emmett Dalton. This page was last edited on 10 January 2019, at 23:12 (UTC).